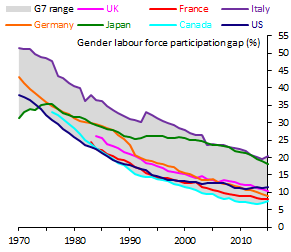 The first chart shows the difference between male and female labour force (15-64 years old) participation rates across G7 countries from 1970. Its message is overwhelmingly clear, the participation gap has shrunk big time! Since 1984, the weighted G7 average participation gap has more than halved (26% to 12% in 2015), with the gap in some countries falling by nearly 21pp. The second chart shows that while some of the fall can be explained by declining male participation (notably in the US), the bulk of the fall is due to increased female participation. 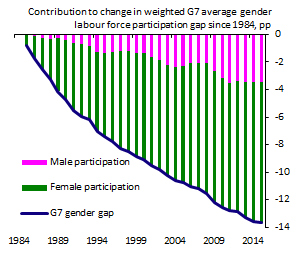 On average across the G7, female participation has increased by around 10pp since 1984. Recent research by the OECD highlighted several factors for this improvement, such as higher educational attainment and increased anti-discrimination legislation. Despite the general reduction, the speed of improvement has been a little sluggish (Japan) and/or the gap is still sizeable in certain G7countries (Japan and Italy). The closing of the gap is also largely a developed word phenomenon, with uneven progress at best across developing nations, according to the OECD. So while this is one downward trend that will have pleased policymakers, it’s something we should all hope reaches the floor sooner rather than later. Thomas Viegas works in the Bank’s Conjunctural Assessment and Projections Division and Gabija Zemaityte works in the Bank’s International Surveillance Division.